On “Black Friday” (am I the only one that hates that term?) we skipped the crazy lines to get in to the mainstream shopping stores to opt for a trip to see part two of the Debbie Reynolds Auction Preview with Chris from Wacky Tacky, Beth from V is for Vintage and her husband, and another good friend. This is the second batch of costumes Debbie Reynolds is auctioning off and they are currently on display at the Paley Center for the Media in Beverly Hills. More information on the auction, including preview dates and a free PDF of the auction catalog are available here. We had gone to see the first batch of costumes on display, which was a larger display and there were the most iconic costumes (shame on me… I forgot to bring the nice camera last time). This batch is still quite fun, but is smaller and not really many iconic costumes you have come to think of when you think of old Hollywood. I didn’t recognize many of the costumes or films, but that just means my list of films to see has gotten longer! :) You’ll have to excuse me as I don’t remember what film or what actor many of my pictures are from, but like I mentioned, the PDF catalog is available for download which says which actor and film each costume is from. Many of the costumes in the catalog were not on display, but of those that were here is a highlight of some of my favorite photos I took. I absolutely love that most are not behind glass so nosy costume enthusiasts can stick their nose and zoom lens closer to get a good look. The close up of the green dress was a costume worn by Carmen Miranda. 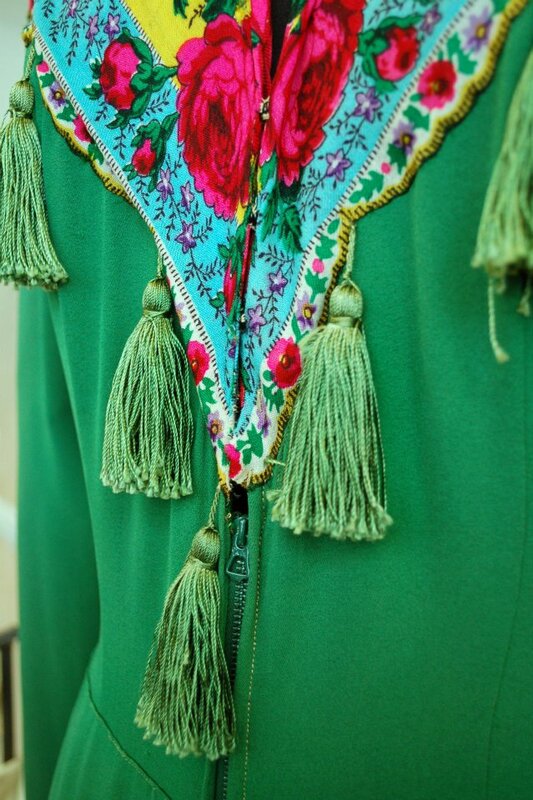 I love the applique of the scarf and the crazy tassels! 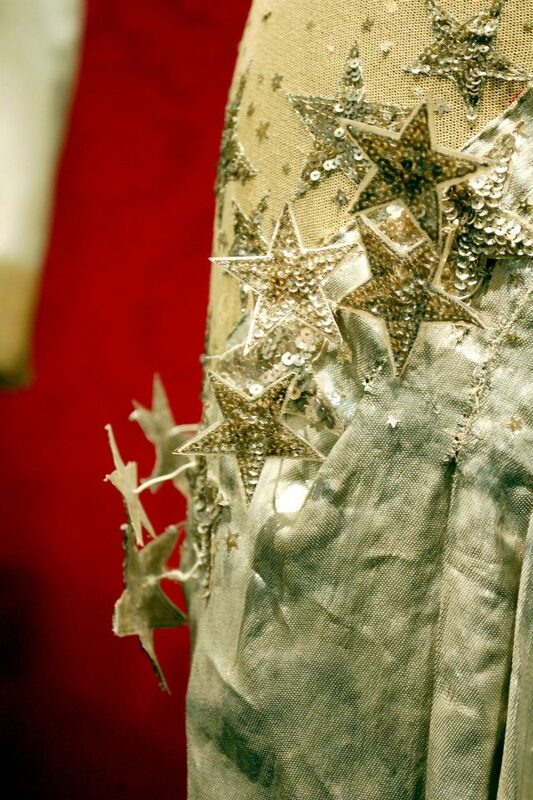 The dress with the stars and cape was one of Sonia Henie’s skating costumes. 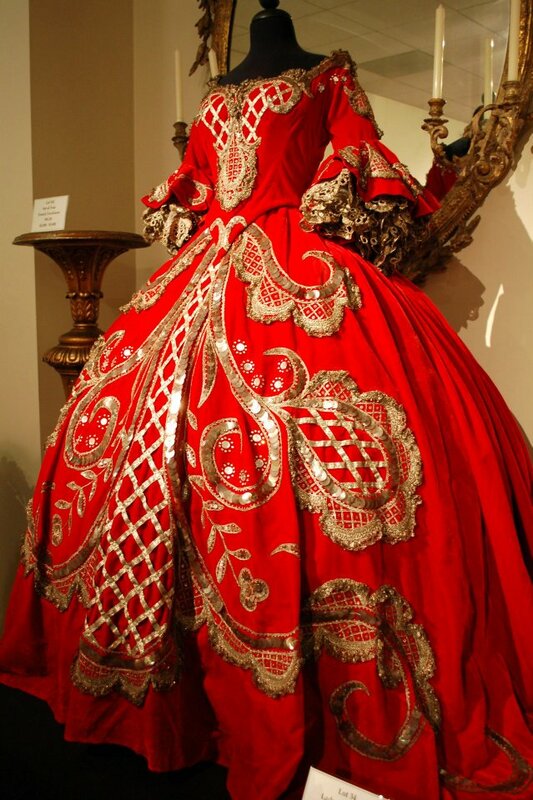 This fabulous dress was designed by Adrian for the film Marie Antoinette. To me, these costumes have always been the height of the over-the-top 1930s film costumes, so it was fun to see a couple in person. This lovely ballgown in the 1890s style was worn by Joan Fontaine. 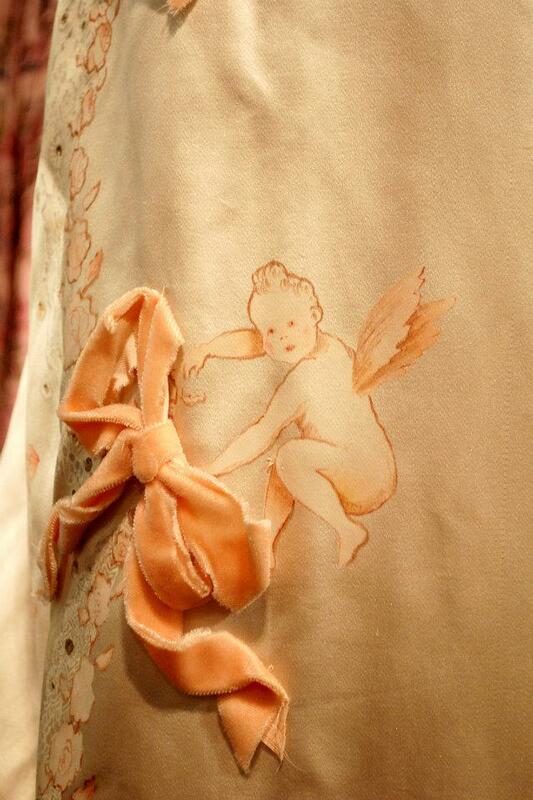 I love the painted cupids and appliqued velvet bows! 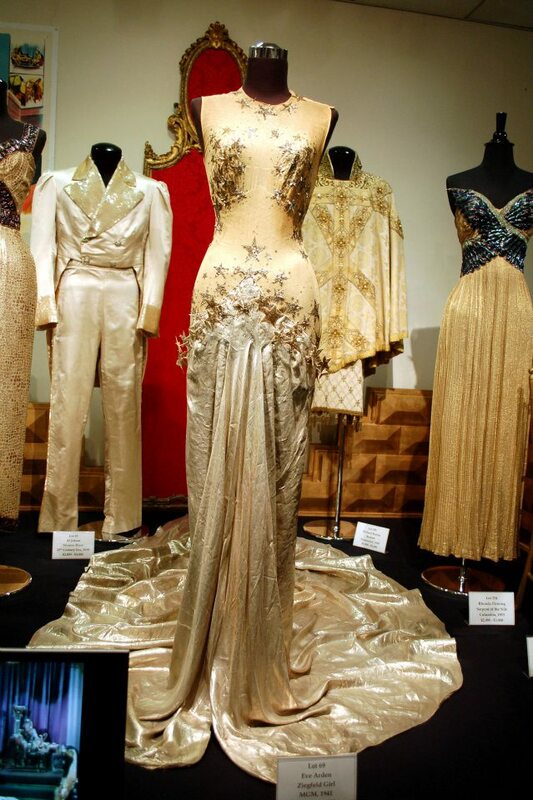 This costume was worn in Ziegfeld Girl. I love the clever way the stars are applied, and Beth pointed out the big exposed metal side zipper. Things like that are so fun to see in person, since everything tends to look other-worldly on the silver screen. The rest of my many photos of my favorite costumes from the exhibit are here on Flickr. Hope you’re all having a great holiday weekend! It was pretty amazing! So sad the collection is getting split up, but hopefully they will go to good new homes! I had so much fun! Your pictures turned out beautifully. How is it possible that I missed that Joan Fontaine dress? I’ll tell you – I get so excited and overwhelmed by all the amazing stuff that I lose focus. Thanks for the good times and great photos! Thanks! It was an awesome day! There wasn’t as much as last time, but there was still TONS to see, and I missed things, too. I actually realized when I got home I didn’t really even read the place cards… just got distracted by the “pretties”. Glad we got to see them while we had the chance! Thank you for the photos and link! I looked through the whole catalog. Some really interesting stuff! It’s such a shame these items where never on a world tour of museums. I would of loved to have paid to see these items. Seeing these pictures made me buy the catalogue. I agree! It’s so sad she was never able to do the museum she wanted to, or even have taken these on tour like you said. The previews are up for such a short time, too, but I’m thankful to have seen it before the collection was split up. Lauren, thanks so much for sharing this, both here and on flickr. Glad to, Lizzie! I feel blessed to see this in person so wanted to share the love.